You’ve tied the knot! You have been pronounced man and wife…now it’s time to serve your wedding guests a great buffet meal. Are you looking for some wedding buffet ideas on a budget? Here are a few ideas to spark your own creative juices and help you to come up with even more of your very own. Your wedding guests won't even know that you are on a budget. One of the most popular foods and one of the easiest to make ahead: Deviled Eggs. These can be jazzed up with flavors and tidbits to make them every bit as tasty as they are pretty. They can rest on beds of lettuce and they make a very pretty presentation. The bonus is that they are not pricey to prepare. Another thing that is not only frugal, but always a hit and can be done ahead, stored in airtight containers is the ever popular stuffed celery. Using cream cheese or peanut butter adds a little something but serving it ‘naked’ will please your guests, as well. Simple crackers arranged on a plate with tiny toppings of sliced olives, or wee slices of assorted cheeses look very appealing. Assorted crackers and/or veggie sticks surrounding bowls of hummus on a plate invite dipping. Stacks of little plates nearby will remind your guests to take a few treats and move along. Something a little grander and somewhat showier would be tiny biscuits topped with egg salad, chicken salad, shrimp salad or thin slices of turkey. If you choose to do the tiny biscuit routine, be sure you have help to bake, slice and top these little munchies. It makes a good assembly line project but it is a good choice if you are faithful to your frugality! Depending on the season of your wedding and weather considerations, you might consider an assortment of fresh fruits. For instance, an autumn wedding can feature as part of the reception a cinnamon flavored apple cider and slices of apple and cheddar cheese. These will not be budget busters and the bonus is that they will make an attractive presentation with little fuss. The Italian favorite of crusty, toasted bread with a tomato/basil topping is always popular with wedding reception guests. Again, you will need to have help in keeping platters of this treat filled and ready to be partaken. It is both beautiful and cost effective. Pita bread and dips are always popular and will not bust your budget. The pita bread can be sliced quickly with a pizza cutter and placed next to bowls of simple dip as if they were chips. Speaking of pizza, you can wow your guests with mini pizzas made with biscuit dough and topped with all the toppings that everyone loves: cheese, mushrooms, and of course pizza sauce from someone’s legendary family recipe. Frugal is your friend, remember! And do request help in preparation and serving. When recruiting help to prepare or serve at your reception, employ your prized creativity. Offer to trade your time or labour for their service. If your neighbour loves to cook and offers to help, take your neighbor up on the offer. If you know that your cousin’s friend has a great recipe and you know how to groom pets, offer to make a swap: recipe for pet grooming. Asking favourite relatives and close family friends to help with the planning, preparation and presentation of the reception foods can be a warm, bonding experience. Memories will be made and intertwined with foods, family and friends during this process. These are to be forever cherished and treasured. It is the EXPERIENCE, not the EXPENSE that makes a beautiful wedding reception successful, enjoyable and memorable. Hopefully this gives you a few Wedding Buffet Ideas on a Budget and you can compliment these with some of your own ideas! I got everything I need to know right on your website. Thanks for providing all the info here. keep writing such beneficial blog. Interesting ideas on wedding buffet. I truly appreciate these ideas. 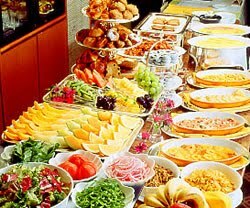 Last week went to a wedding party at one of iconic venue Houston of my friend and most amazing thing was buffet there. That was so yum and tasty. Really enjoyed the food.